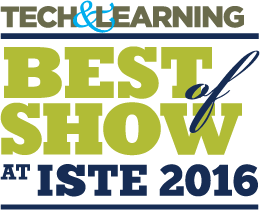 We will have answers for Tech & Learning's ISTE 2016 Best of Show Awards. This special marketing program celebrates those products and services that show the greatest promise according to the country's most tech-savvy educators. Awards will be judged and awarded by NewBay Media publications AV Technology, and Tech & Learning magazines. ISTE exhibitors may submit a product for consideration by one or more of these leading publications, and may submit multiple products for consideration. Here’s how it works: Selected Tech & Learning and AV Technology advisors will scour the show floor on the first day of ISTE 2016, investigating the latest and greatest announcements from participating vendors. The judges will each rate their impressions on a sliding scale, then meet to decide on which technologies could have the most impact in the classroom and thus deserves the “amazing” moniker. The recipients will be announced on TechLearning.com and AVNetwork.com before the conclusion of ISTE 2016. Winners will receive a certificate that can be displayed at the booth and will receive a mention online and in the print August Best of ISTE 2016 issue. While Tech & Learning’s decades-old Award of Excellence involves advisors judging products after an extensive hands-on experience, the T&L ISTE 2016 Best of Show focuses on the potential of the tech — Which are the game changers? You may enter as many products as you'd like. Due date and entry fee information are listed below. What are the ISTE Best of Show Awards? The program recognizes outstanding products exhibited at the International Society for Technology in Education show. Winners are selected by panels of professional users and editors based on descriptions provided by you via the nomination form as well as on judges’ inspection at the convention. Any company that has a great product to display on the ISTE exhibit floor. Hundreds of new products are displayed at ISTE each year. Help make yours stand out. The deadline is 5:00 pm EST on June 17, 2016. We reserve the right to consider late applicants as circumstances dictate. Please note that on-site nominations are not accepted. A panel of judges and editors, chosen in advance by the editors of our publications, will review nominations and choose the winners. Yes. It will not be published prior to the convention or shared with anyone beyond the judges or editors. When will you notify winners? Prior to the conclusion of ISTE 2016. Awards will be given by NewBay Media publications AV Technology and Tech & Learning. Winners receive an award for display, and winners will be reported in the August issue of Tech & Learning. Bonus! All nominated products – whether they win or not – will be featured in the digital version of the Best of Show Program Guide delivered to readers of AV Technology and Tech & Learning after ISTE 2016. Be included in this roundup of the most interesting products shown at ISTE 2016 Enter your product(s) now! What if I have a question about the form? Email Stephanie Rubin at srubin@nbmedia.com.